Nearly seventy years later, in the same hotel, acclaimed journalist Christopher S. Stewart wonders what he's gotten himself into. Stewart and Morde seek the same answer on their quests: the solution to the riddle of the whereabouts of Ciudad Blanca, buried somewhere deep in the rain forest on the Mosquito Coast. Imagining an immense and immaculate El Dorado-like city made entirely of gold, explorers as far back as the Spanish conquistador Hernan Cortes have tried to find the fabled White City. Others have gone looking for tall white cliffs and gigantic stone temples--no one found a trace. Legends, like the jungle, are dense and captivating. Many have sought their fortune or fame down the Rio Patuca--from Christopher Columbus to present-day college professors--and many have died or disappeared. What begins as a passing interest slowly turns into an obsession as Stewart pieces together the whirlwind life and mysterious death of Morde, a man who had sailed around the world five times before he was thirty and claimed to have discovered what he called the Lost City of the Monkey God. Armed with Morde's personal notebooks and the enigmatic coordinates etched on his well-worn walking stick, Stewart sets out to test the jungle himself--and to test himself in the jungle. As we follow the parallel journeys of Morde and Stewart, the ultimate destination morphs with their every twist and turn. Are they walking in circles? Or are they running from their own shadows? 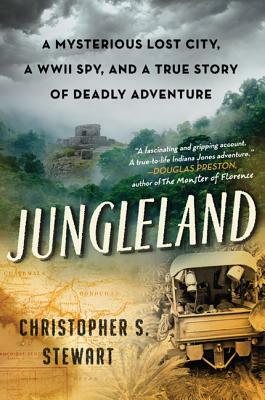 Jungleland is part detective story, part classic tale of man versus wild in the tradition of The Lost City of Z and Lost in Shangri-La. A story of young fatherhood as well as the timeless call of adventure, this is an epic search for answers in a place where nothing is guaranteed, least of all survival.